Villa Guatiza is in itself a small masterpiece. 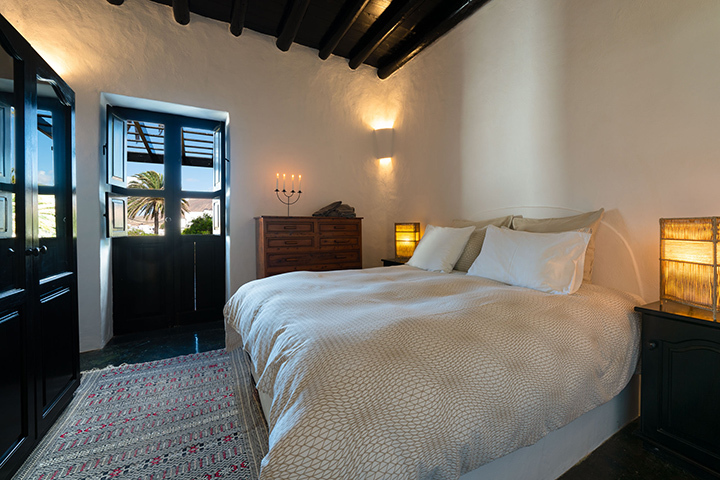 It has been completely renovated with a sensitive approach to the building traditions on the island of Lanzarote. A lush garden surrounds this private self catering holiday paradise. Wide painted steps lead onto the rustic veranda in front of the covered entrance to the house. 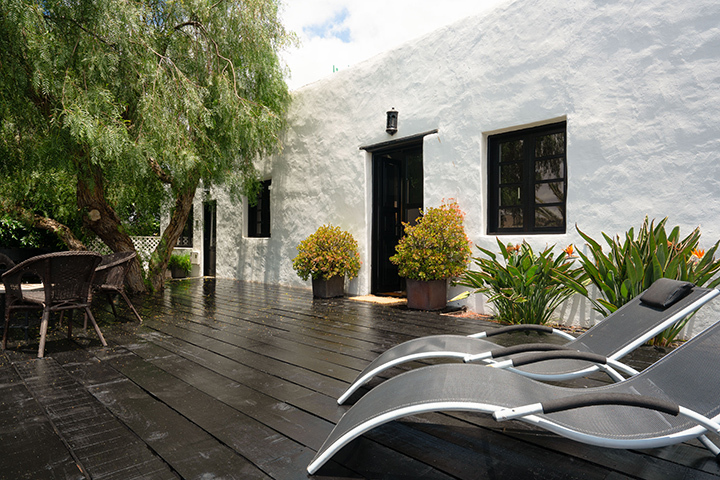 The rental property features two large bedrooms with en-suite bathrooms, which open on to a 110m2 wooden deck. The third bedroom has a quality sofa-bed with down cushions. The open plan kitchen-dinning room is very spacious with beamed 10m ceilings, and a beautiful Moroccan lamp hanging over a handmade cedar table which seats 8 people. 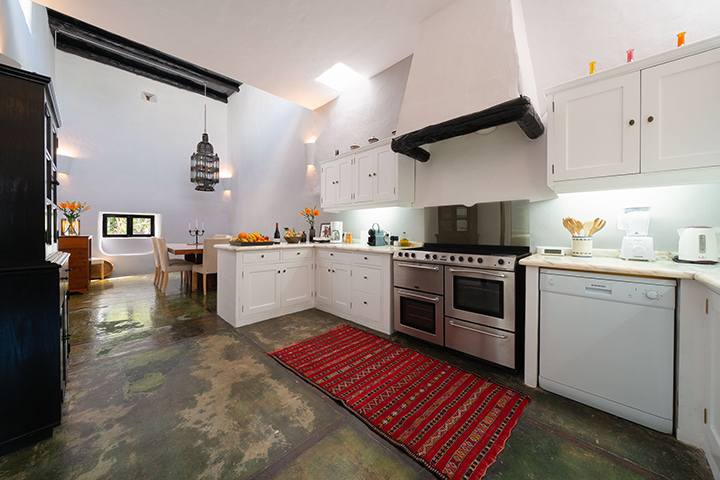 The cooker has 6 burners, 3 ovens, dishwasher and complete inventory - perfect for self catering holidays. In the salon there are 2 proper Italian sofas and 2 large easy chairs, plus surround sound stereo system with DVD, Ipod, 100+CD, satellite TV, wooden floors and Moroccan rugs. We have installed an ADSL line with cordless WIFI for your laptop computer. The linen, towels and duvets are of superior quality, and a laundry room with washer/dryer is available - also we can provide baby beds and high chairs with quality linen. The rear patio is fully private with a heated swimming pool, gas barbecue, handmade dining table with an olive tree, flowers and teak sun beds. 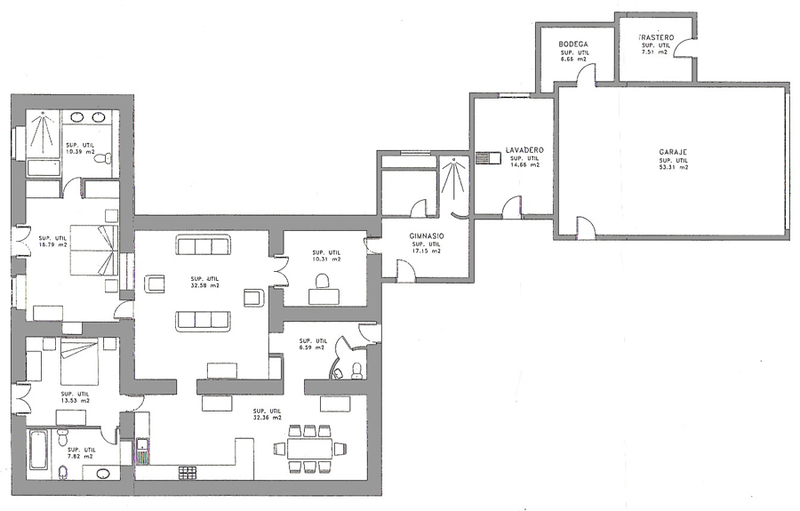 The gym is entered from the patio of the house and has a good sauna. There are bicycles, boogie board and Malibu surfboard in the 54m2 garage which has an automatic door. The house sets on 7500m2 property and walking/riding trails are minutes from the front door. The Lanzarote town of Guatiza is home to the Manrique Cactus Gardens - there are 500 residents with a good village supermarket 2 minutes walk from the villa. 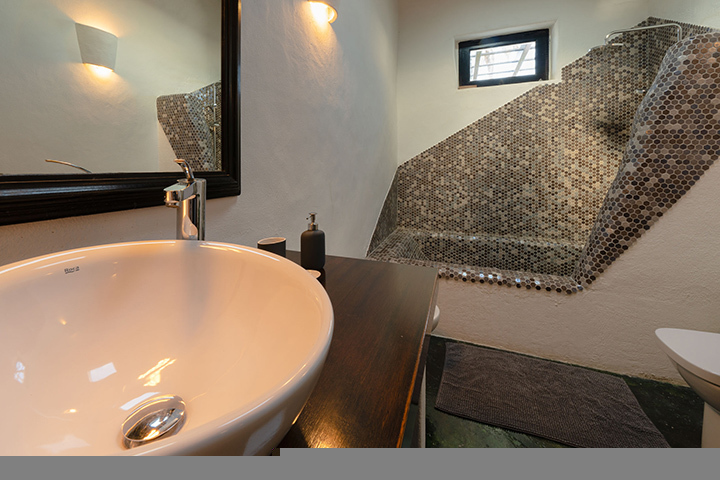 This 200 year old farm house holiday home has been especially popular with professional couples wishing to get away from the tourist areas. Yet it's less than 10 minutes to lovely Lanzarote beaches and seafood restaurants, and the 18-hole golf course is 15 minutes casual driving. The pool area has a lovely olive tree and several potted flowering plants, also a handmade dining table under the gazebo, 4 teak sun beds and a gas BBQ. The large mature garden with its palm trees, exotic plant life and the ever-fascinating volcanic landscape surrounding this private holiday paradise, can be appreciated from the tranquility of the very large covered wooden veranda in front of the villa. 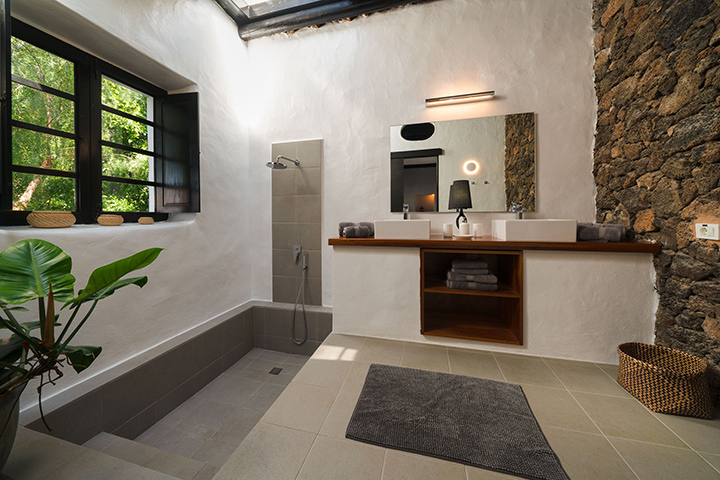 This exclusive villa with its harmonious blend of rustic charm, and modern facilities, is the ultimate holiday home for those who appreciate tranquil country location along with superb quality self catering accommodation. 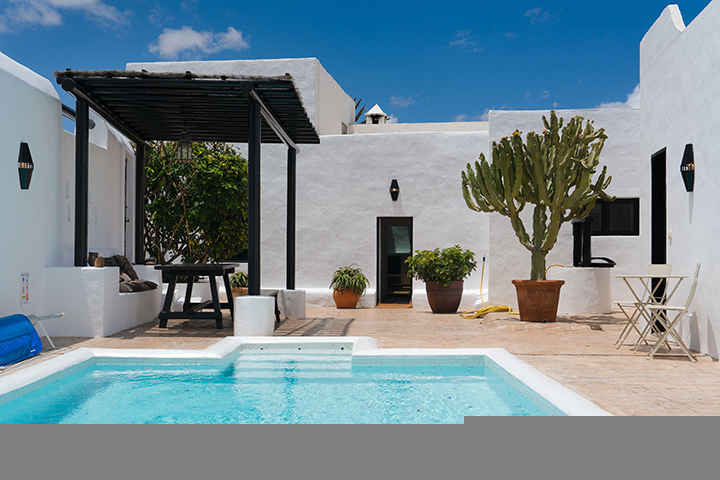 Villa Guatiza is a 200 year old farmhouse villa in lanzarote that we spent a some years renovating. 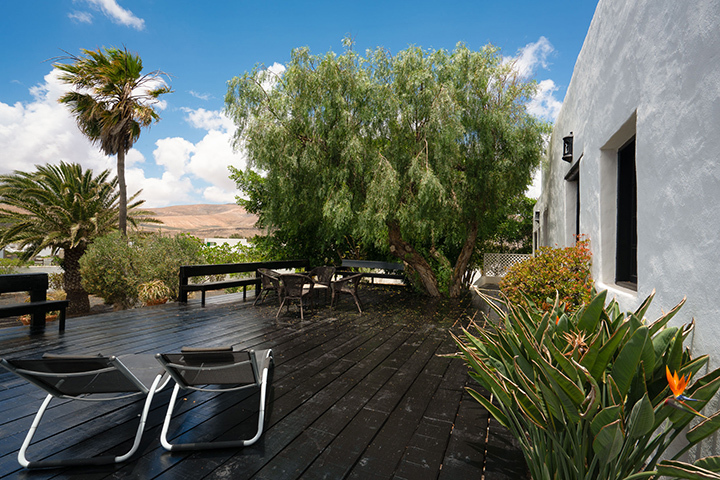 This Lanzarote Villa sits on large grounds, with a large wooden deck, and a large fully enclosed terrace. There is a heated pool, sauna and gym as well as a garage with and automatic door - bicycles, a surf board and boogie board are there for your use. 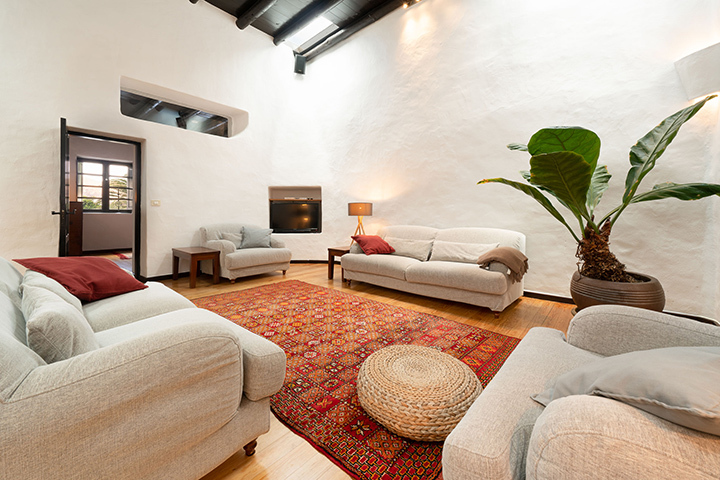 The interior of this holiday home in lanzarote is rustic. The ceilings are mostly beamed, and between 5-10 meters in height. 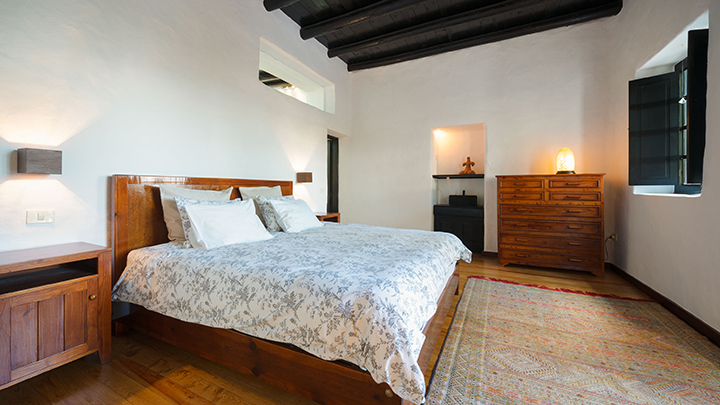 Many of the floors are wooden, with Moroccan carpets in the bedrooms, kitchen and salon. The two sofas in the Villa are Italian, as are the big easy chairs. The pool area has a lovely Lanzarote olive tree, and several potted flowering plants. Also a handmade dining table under the gazebo, 4 teak sun beds, and a gas BBQ!